The name curry is an English word that is commonly given to any dish of meat, fish or vegetables that is served in a rich, spicy sauce. Different types of curries however, require very different techniques to prepare. There are a huge range of dishes from different parts of India that are all referred to in the UK as curry. The word has become a catch-all term for any dish of meat, fish or vegetables cooked and served in a spicy sauce. Most of the interpretations of these that are available in Indian restaurants catering to British customers bear little or no relation to the dishes in their authentic form, as anyone has been to an Indian wedding reception can tell you. Korma is one of the most often traduced dishes, served in a bland creamy sauce that has been turned bright yellow by being overloaded with turmeric. Like most Indian curries, korma is traditionally cooked in a sauce that is much closer to what we would think of as a rich, albeit spicy, gravy and has a broad flavour profile thanks to the garam masala and the Indian custom of representing every one of the six flavour groups in every dish. This darkly fragrant dish bears no resemblance whatsoever to the dayglo travesty often served in its place. 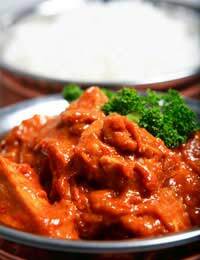 Tomato-based sauces are also common in Indian curries. Thai curries, and many other curries from Pacific countries such as Malaysia and Indonesia, are different from typical Indian curries. There is greater emphasis on the sharply sweet and sour flavours of tamarind, lemongrass and kaffir lime leaves. The hottest Thai curries are made using stock as a base in a similar way to Indian curries and are fiercely sour and fiery. More familiar are the green and red curries made with the relevant coloured curry paste that can be found in shops and restaurants around the UK. These are cooked with a base of coconut milk which helps take the edge off the heat and results in a smooth liquid sauce. Sweet basil, palm sugar, fish sauce and shrimp paste are often used to bolster the flavour of pleasingly textured ingredients such as bamboo shoots and water chestnuts. Yellow curry is similar but gets its colour from turmeric rather than curry paste and is thicker and less spicy thanks to the addition of coconut cream. One of the features that has made Thai food so popular internationally is its flexibility. Curry sauces can be made using red meat, poultry, seafood, tofu or vegetables as required, bringing a distinctive set of flavours to any ingredients that are available. When cooking curries of any sort it is usually advisable to remove the seeds from any chillies that are being used. The seeds are not just the hottest part of the chilli, they also hold a powerful bitter taste that can easily obscure any more subtle flavours present in the dish. If extra heat is needed it can easily be achieved by using dried spices such as cayenne pepper or chilli powder. The recent trend for ridiculously hot sauces that can ruin an entire pot of curry with two drops is lamentable, replacing actual flavour with a burning sensation. These should be avoided at all costs.